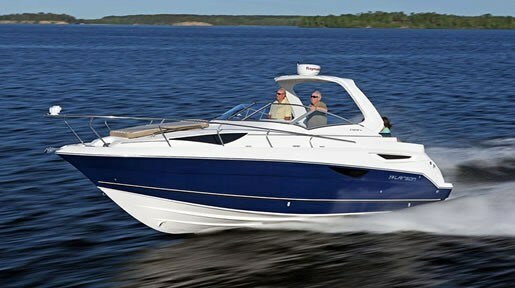 For 2012, Larson offers twenty-one models from 16 to 30 feet, a remarkable seven of which are brand new models this year. 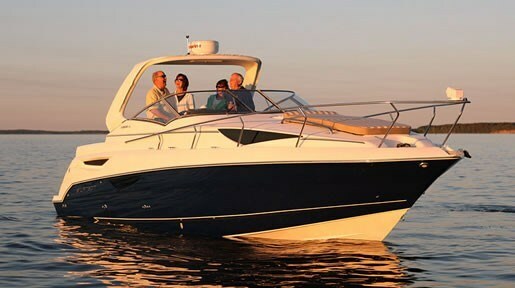 There are four Series; eleven models in the LX Series of "entry-level" outboard and sterndrive-powered bowriders and one cuddy cabin, the 3-model LXi Series of "luxurious family sportboats," the 3-model Cabrio cruiser Series in 25, 28, and 30 feet, plus the all new 4-model FX Series of "serious fishing boats for serious fishing." 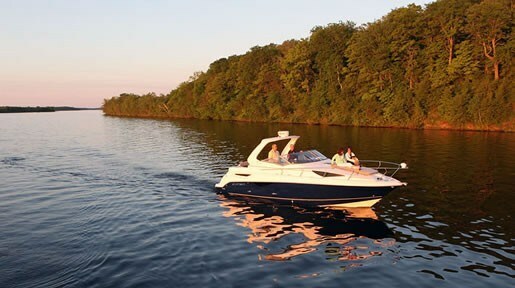 The Cabrio 927 is Larson's newest family mid-cabin cruiser model at almost thirty and a half feet on a ten and one-half foot beam and riding on Larson's trademarked SofRide™ V, moderately deep 19° deadrise hull. As with every Larson hull, the Cabrio 927 is manufactured utilizing VEC® technology, the patented, computer-controlled, closed-molded composite lamination manufacturing process. "In fact, Larson is the only boat brand in the world made exclusively with VEC® Technology." The VEC® Structural Hull Lifetime Limited Warranty is even transferable to a second owner. 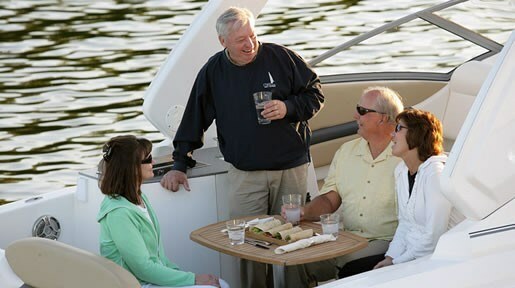 The Cabrio 927 comes standard with certain features which often are optional on many cruisers this size while there is still a considerable list of options available to you to satisfy specific cruising needs. Cockpit seating includes a U-shaped lounge aft with both a large teak table and filler cushions to create a sunlounge, all standard equipment. The transom and starboard side seat sections of this lounge fold down to open up and enlarge the cockpit. A double-wide stern-facing jumpseat is permanently mounted above the integrated swim platform. This platform has a concealed telescoping boarding ladder, molded holders for two large fenders, a transom shower, and a storage locker. Opposite the helm is portside "sunlounge" seating and aft of that, a standard wetbar with sink, faucet, "stone" countertop, and refrigerator below. A stainless steel grill is optional, as is a custom radar arch over the cockpit. The helm features a double-wide adjustable seat with flip-up bolster and footrest. With the recommended twin sterndrive power (a single MerCruiser 8.2 Mag MPI w/Bravo III drive is available) the dash is busy with its full complement of instrumentation to starboard and molded steps to the centre walk-thru windshield to the foredeck. A starboard side windshield wiper is standard. Below, the cabin offers a traditional layout with L-shaped dinette to port and galley and head to starboard. Lighter-coloured materials and fabrics help to brighten and enlarge the cabin as do two hullside forward windows. The dinette table features a wood inlay section and drops down to convert to a double berth. Forward is a side/V double berth with privacy curtain and storage locker and storage below, as has the dinette. The aft cabin (mid-cabin) provides a double-wide berth, window with screen, and a full-width storage cabinet. An optional Décor Package including a different choice of curtains, pillows, shams, and fore and mid-cabin privacy curtains is available to change the interior look of your Cabrio 927. The galley is well equipped with molded countertop and sink, microwave, two-burner electric stove, refrigerator, cupboards, and even dedicated wine storage plus two molded-in drinkholders! The very stylish looking fibreglass-lined enclosed stand-up head features a standard electric china toilet, upper and lower storage, a power vent and shower wand with curtain. There are a number of individual and packaged options to consider. 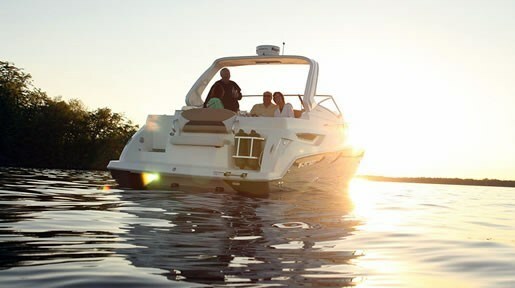 A Convenience Package includes a bow sunpad, dockside water hook-up, and a remote-controlled spotlight. A Ray Marine E70, Electronic Package with 7" touch split-screen GPS plotter with radar and a depth sounder is available if you also choose the optional radar arch, or without the arch, choose the same Ray Marine split-screen unit and depth sounder but with no radar. Individual notable options include a bow thruster, extended swim platform, auto fire extinguishing system, generator, air conditioning/reverse cycle heating, surround sound, and various flatscreen TV and DVD possibilities, etc. Twin MerCruiser sterndrive power from 260 to 320 horsepower is optionally available with or without DTS (Digital throttle and Shift) and/or AXIUS joystick control. Twin Cummins diesel power is also available. Choose from four hull colours with or without colour-coordinated fully enclosed cockpit canvas, and a trailer too. Lots of standard equipment and lots of options. The choices are yours.